All that and a side of Vegan Caesar dressing! Day one of juicing went well! I know you were all wondering. I don’t think it was particularly hard for us because we aren’t doing a full fledged juice fast. For one, it’s not recommended that I do one while I’m a nursing mom. I don’t want to jeopardize my milk supply or risk toxins coming out of my breast milk and into my Ryder-kins. Not worth it. We just wanted to do a half a day of mini fasting and then add in juices everyday as snacks along with our regular healthy meals–for at least five days. Then hopefully everyday there after. 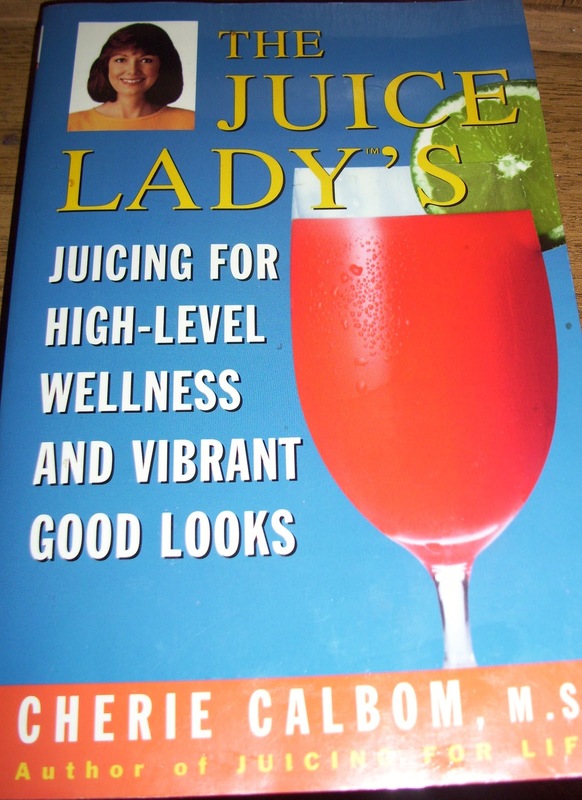 I mean, doesn’t everyone want to incorporate healthy juices for ‘high-level wellness and vibrant good looks’? Well your in luck! I’ve got the book for you! One of my favorite books–EVER! I’ve had this book for going on 9 years and to this day it excites me every time I open it. It’s filled with juices for every ailment and/or desire you could ever possibly imagine! 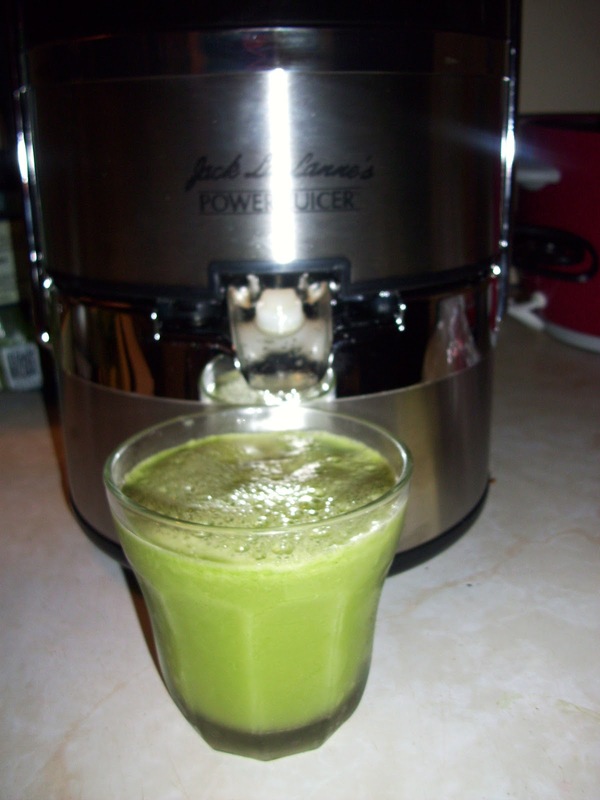 Every time I make a juice from it, I feel invigorated. I highly recommend this book to anyone who is starting out or even if you’ve been juicing for years. There’s something for everyone! It’s amazing! So day one of our juicing adventure went something like this. Juice for breakfast, juice for morning snack and juice for afternoon snack…they all looked a lot like this. I didn’t want to bore you with all of the juices since they mostly all looked the same. I wish you could smell and taste them! Now THAT would surely win you over! 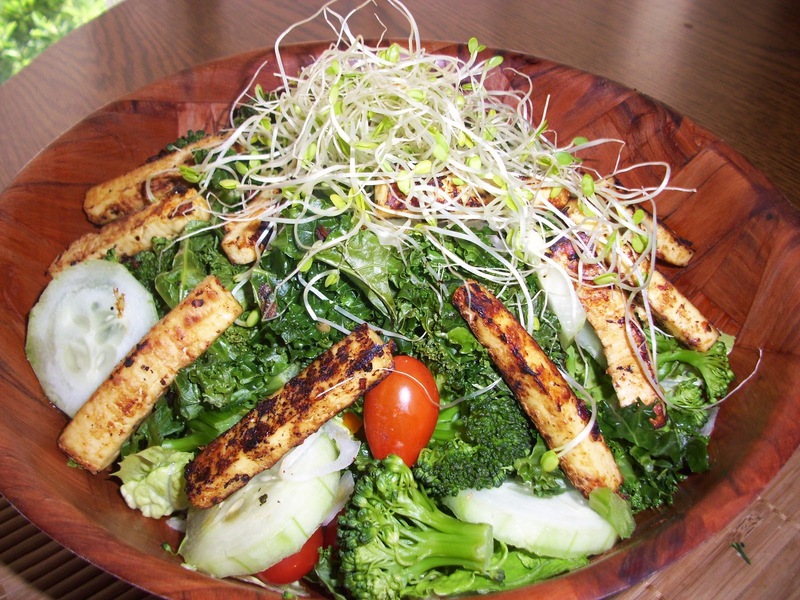 Lunch was this Asian style grilled tofu salad with my own emulsion of Asian garlic chili sauce, ginger, onion powder, rice vinegar and coconut oil. YUM! We finished the day with this healthy dinner. 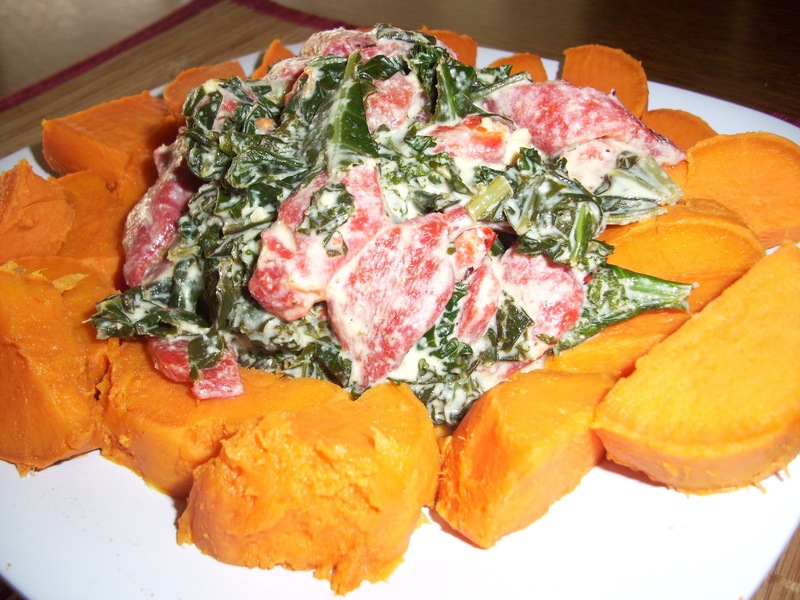 Sweet potatoes with fresh orange juice braised collard greens and roasted red peppers tossed in a raw cashew cream sauce. We felt good. Well, all except the crazy irritability my husband had from caffeine withdrawal. He had a splitting headache all day and was quite mad about it. Yikes! Thankfully I was busy baking cupcakes and filling Mrs. K’s weekly food order so I stayed out of his way. Poor guy. Such a trooper! Here we are on day 2 and I’m happy to report that Rance is still caffeine-free AND headache free today! Plus, he’s full of juice induced energy! So what did we learn children? For best results, stick with it! We started our (Rance and I) day with this beautiful beet-collard-lemon-ginger-celery-cucumber-apple juice! It left me feeling so energized that I took the boys out on a 3 mile walk around our neighborhood! 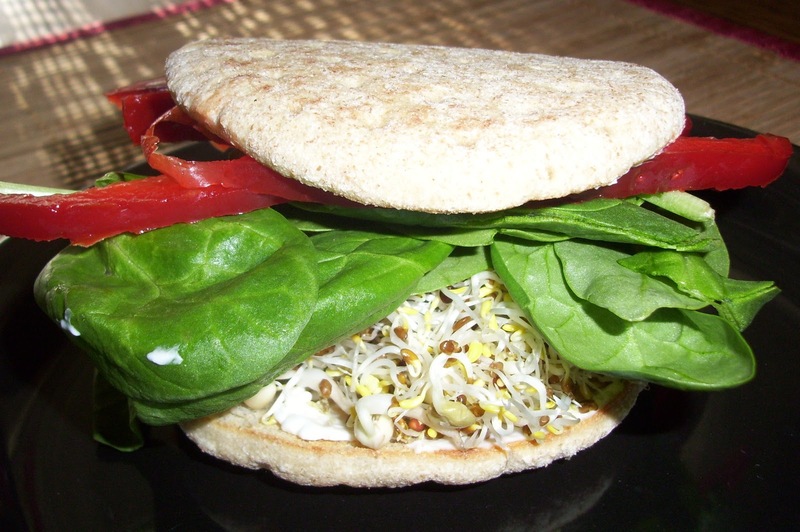 When I returned I really wanted something to chew so I opted for this sprouts, spinach, peppers and Tofutti cream cheese breakfast sandwich. Yes, those are MY sprouts!! I am so proud of those babies! Look how many I harvested in 3 days! They are the epitome of good health, my friends. 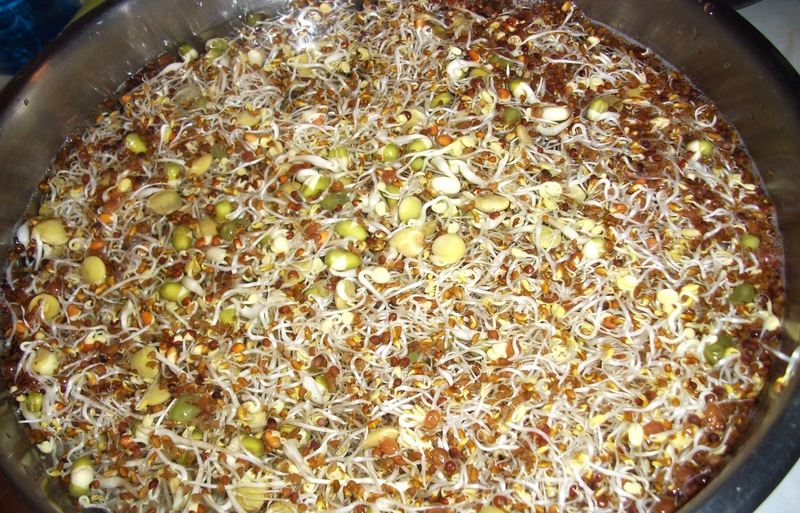 You must look into the benefits of eating sprouts and get to it. I’m telling ya! For lunch today, I sent the same salad for Rance as I made myself here at home. Along with a revamped dressing recipe I had found in a Vegan cookbook I checked out at the library. He called me from work to tell me that the dressing was the best he’d EVER had! Huh? Say what? Better then ranch, baby?? OK, I have to agree, it’s pretty darn amazing. And easy to make!! What? Yes, of course I’m sharing it with you! What fun would it be to know something amazing and not tell the people you love about it?? Brace yourselves. This one is insanely delicious. You could easily swap this in a Caesar salad and no one would be the wiser. Riley also believed it was ranch and gobbled it right up. You can thin it out with more water to make it go farther or leave it as is. You could even lessen the water and make a super creamy party dip! So good!! YOU REALLY HAVE TO TRY THIS ONE!! PPV: 2 points per two heaping tablespoon servings! Combine all ingredients in the blender. Puree until very smooth. No cashew granules should be left. Add more water to thin out as desired. Taste test, add additional lemon juice and agave if needed. 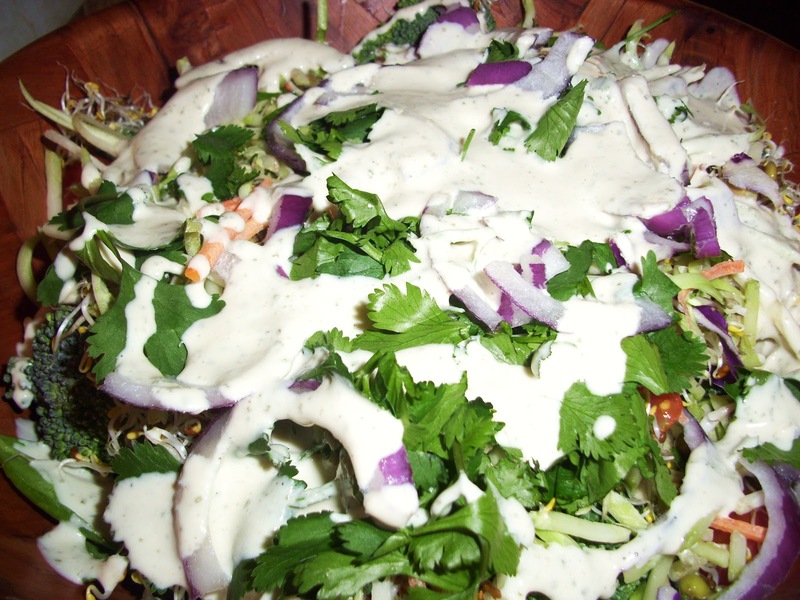 This dressing will thicken after refrigeration, you can thin it by stirring 2-3 tsp water if desired. Who needs ranch?! Pour it on and enjoy, friends! Next Post Juicing To Infinity and Beyond!